On Saturday 7th November, DESY opened its doors as part of the Hamburg-wide Night of Knowledge for more than 18,000 visitors, and with more than 9,500 visiting the Center for Free-Electron Laser Science (CFEL) on campus. The Controlled Molecule Imaging group (CMI) presented itself and our work with a number of fun experiments, as well as posters and a virtual lab tour. For the smaller visitors, Nicole Teschmit organized practical experiments to show some of the excitement that can be generated with liquid nitrogen, producing delicious frozen-yoghurt ice cream or breaking flowers into thousands of pieces. Using a glass vacuum bell we showed what happens to everyday objects in vacuum – from the expansion of marshmallows and Schokoküssen to a motor running solely on ‘cucumber power’. For the adults, we prepared two demonstrations which showcase some of the basic principles used in our experiments. A mechanical Paul trap, designed by our technician Karol Długołęcki, that is a rotating saddle-shaped surface, was used to trap a ping-pong ball. 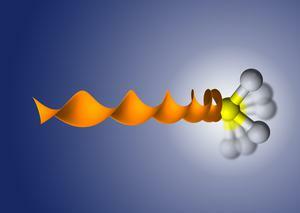 This demonstrated how a dynamically switched potential can stably trap particles. Another type of particle trap, designed by our engineer Daniel Gusa, used electrostatic fields to trap air bubbles immersed in oil, and also showed how bubbles outside the trap are repelled by the ‘invisible’ electric fields. We hope all the visitors had as much fun as we had and we are looking forward to the next Night of Knowledge in 2017. Nicole Teschmit prepared eiscream with liquid nitrogen. Nicole is serving eiscream to kids and adults. Nicole and Nele demonstrating experiments. Frozen rose broken on a table into tiny pieces. Chocolate marshmallows expansion in vacuum. CMI experimental stand in the CFEL Foyer.